Iraq's military says it has stormed the town of Hawija, as it steps up an offensive on one of so-called Islamic State's last enclaves in the country. Soldiers, special forces, police and paramilitary fighters reached the town centre after breaking through jihadist defences in the west, commanders said. They began moving on the town early on Wednesday, two days after retaking the Rashad airbase to the south. Pro-government forces have made swift progress against IS in recent months. Since declaring victory of Mosul in July, they have driven militants out of the nearby city of Tal Afar and advanced along the Euphrates river valley in the western desert, near the border with Syria. What happens after Islamic State leaves? 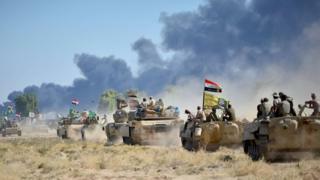 The offensive on Hawija and its surrounding area, about 215km (135 miles) north of Baghdad, began on 21 September with US-led coalition air-and-ground support. After recapturing the town of Shirqat on the second day, they continued pushing south-eastwards towards Rashad airbase and the towns of Hawija and Riyadh. On Wednesday morning, military commander Lt Gen Abdul Amir Yarallah said troops had begun a major operation to "liberate" Hawija. Federal police chief Raed Shakir Jawdat later said his officers had entered the north-western Nidaa and Askari districts, killing three IS snipers and destroying two booby-trapped vehicles. Iraqi state television pictures from the area showed the air filled with thick black smoke created by oil-well fires, which were started by militants to limit air strikes. Then on Wednesday evening, Gen Yarallah announced that troops had stormed the centre of Hawija, clashing with IS militants and inflicting heavy losses. The UN warned on Tuesday that as many as 78,000 civilians could be trapped inside Hawija. Jens Laerke, for the Office for the Co-ordination of Humanitarian Affairs (OCHA), said an estimated 12,500 people had fled the town since the start of the offensive, and that more were expected to attempt to escape in the coming days as troops pushed into densely populated areas. "We remain concerned for the lives and well-being of these vulnerable civilians and remind those doing the fighting that civilians must be protected at all times and allowed to safely leave Hawija," he told a news conference in Geneva. Humanitarian workers were on the ground at checkpoints to help those fleeing and provide shelter and assistance in camps and emergency sites, Mr Laerke added.